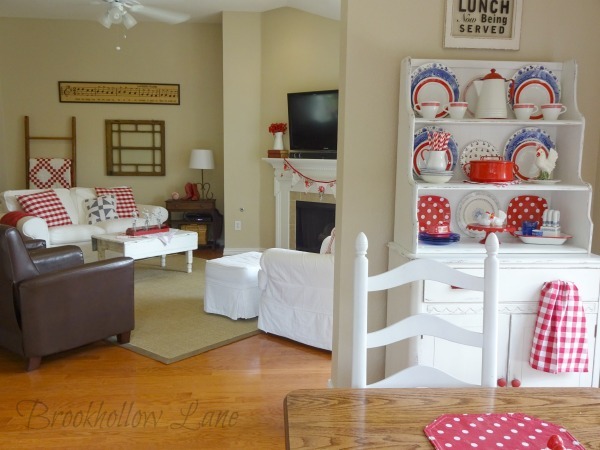 Here's the family room with touches of red and a dash of blue. Another vintage quilt square pillow. 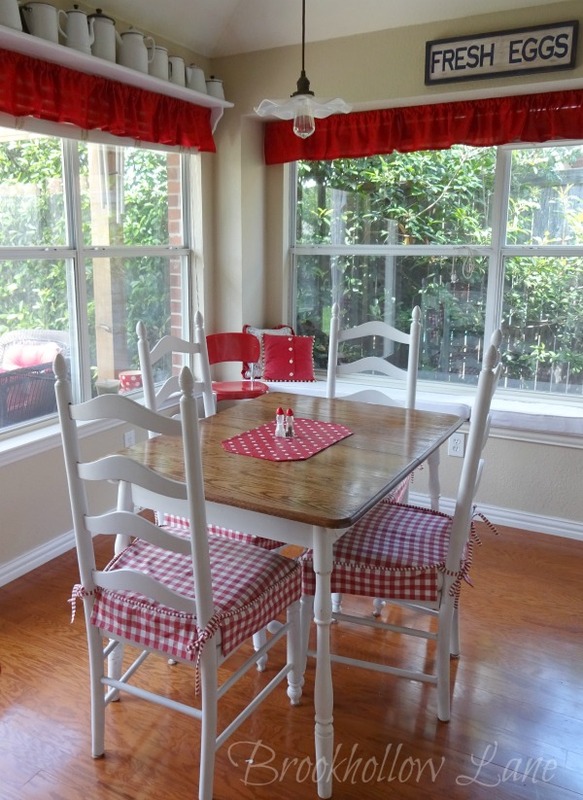 The white fringe was reused from an old tablecloth. 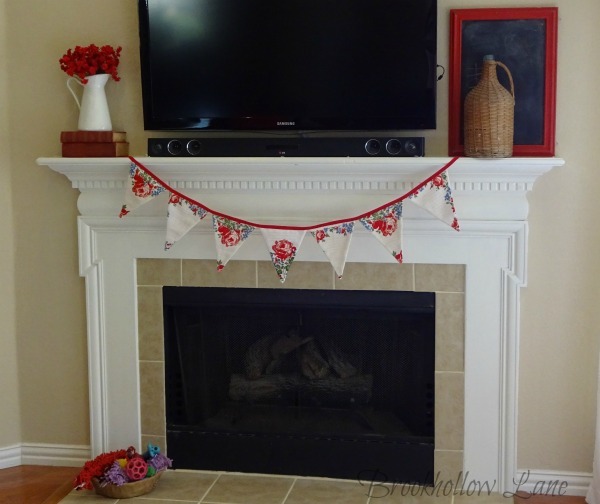 Used my cottage bunting on the fireplace. Found these tiny cowboy boots at a garage sale years ago.I love how worn the toes are. The little milk bottle coasters are from Moda. 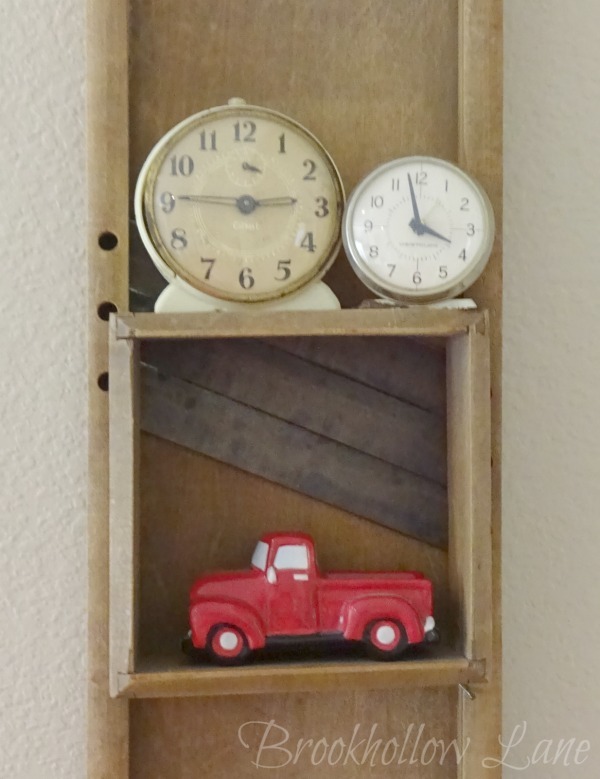 I saw this idea at Carol's at Art and Sand. 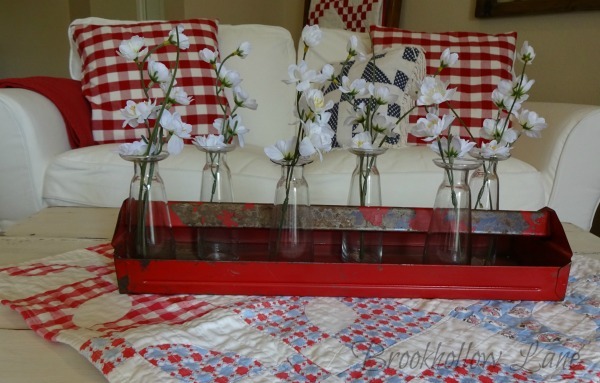 I already had the tool box tray and little glass vases so I just added some flowers to it. Sitting on an old red, white and blue quilt remnant. 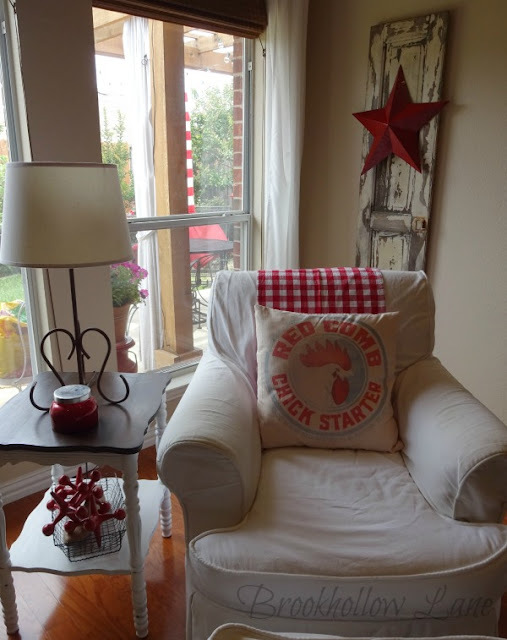 This pillow was made from an old feed sack. I looked and looked until I finally found the one in the right colors. Best of all it had a rooster! Brought out my old red key. Here's the kitchen hutch all done up in red and blue. Almost everything you see in the hutch was gotten at the thrift store or garage sales. I can't tell you how much fun it is to go on the hunt. Here's view from kitchen nook into the family room. You can see how open it is. that's why I have to tie the colors in together. 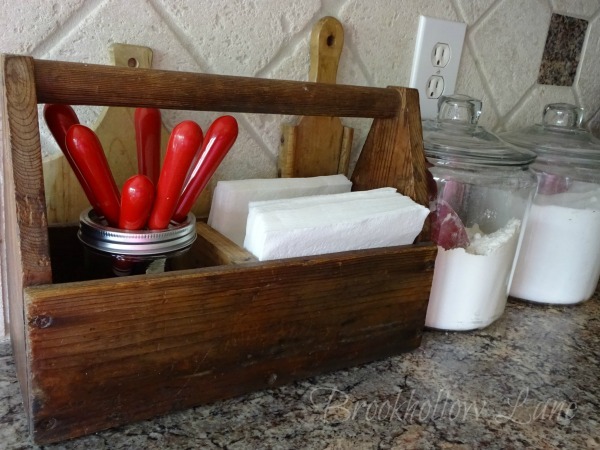 Some red handled flatware in my old toolbox. View into the kitchen. I haven't shown this in awhile. 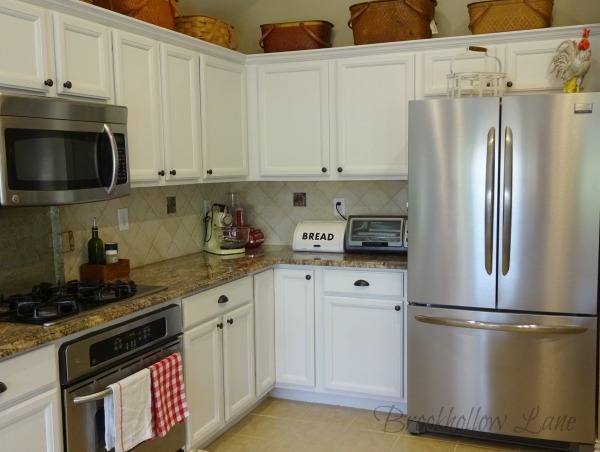 I don't do much in here-just the towels and Aunt Ruth's rooster on the fridge. Older son painted the Fresh Eggs sign years ago. Little slip covers brought out for the chairs. It took awhile to take pictures. It has been raining and raining here on Dallas. And more to come this week. I hope you all are enjoying a start to your summer. Hi Leslie - How cute your home is. 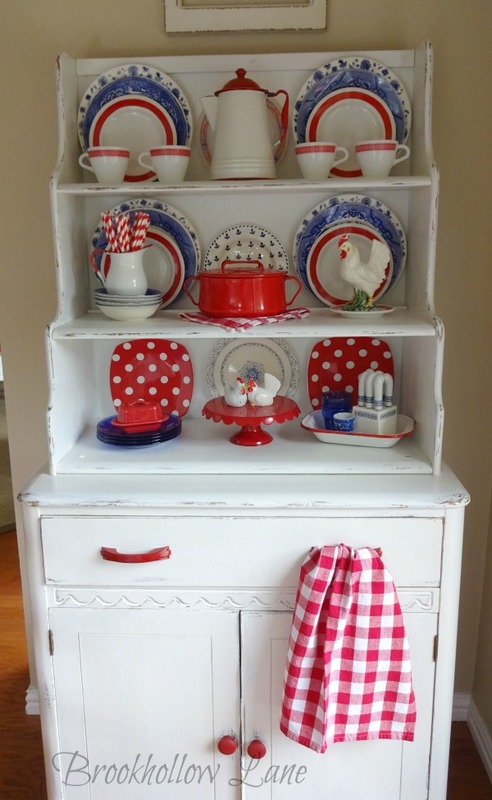 Love the red, white and blue. 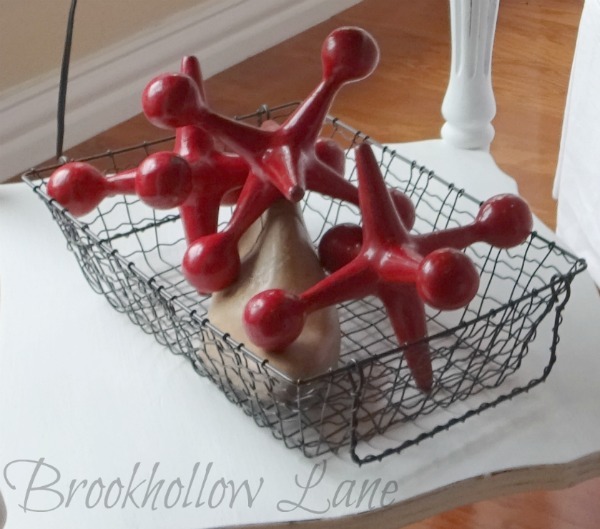 I so enjoy visiting your home and seeing how you decorate with your awesome finds. I love all the red touches. Thanks, Deb. I love red too. It's such a happy color! Leslie, this is so charming! It says 'summer' all over. Hi Leslie, WOW I love your red, white and blue. This truly is magazine worthy. 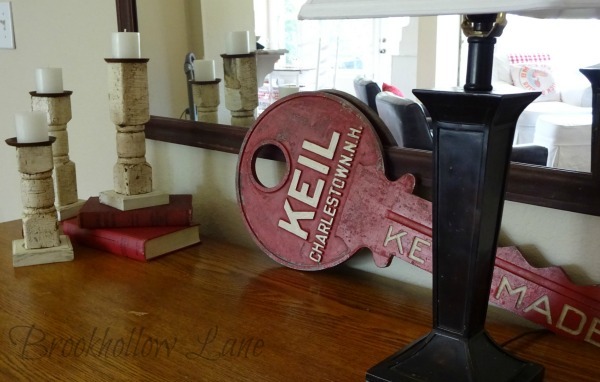 Love all your creative touches from the pillows to the large key, I love it all. I really have to go back and view it all again. You really have a great eye for pulling it all together. 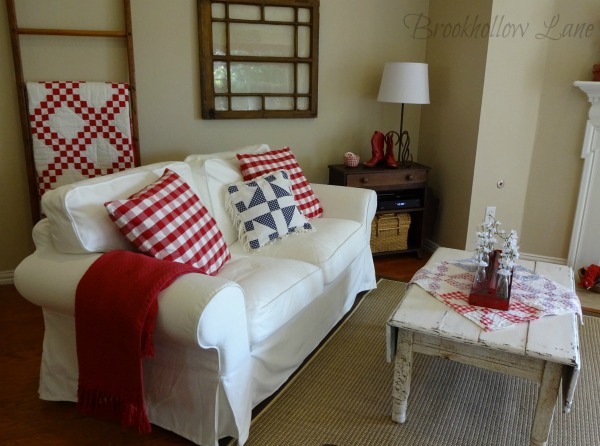 I am inspired to do mine now and bring out my blue willow for the summer with a pop of red!! Thanks for sharing. Stay dry, lots of rain still on the way. 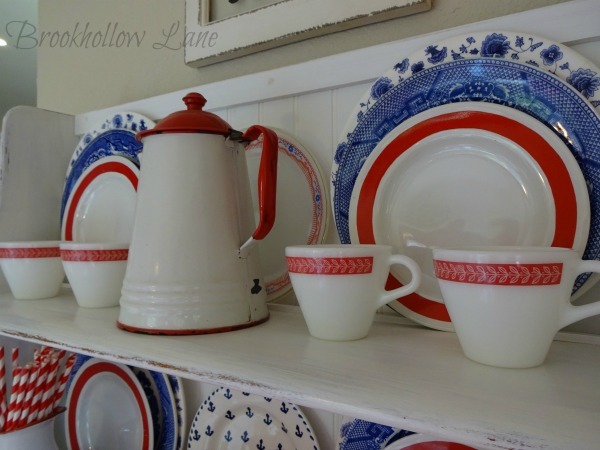 Your home is so cozy and I love all your red, white and blue touches. 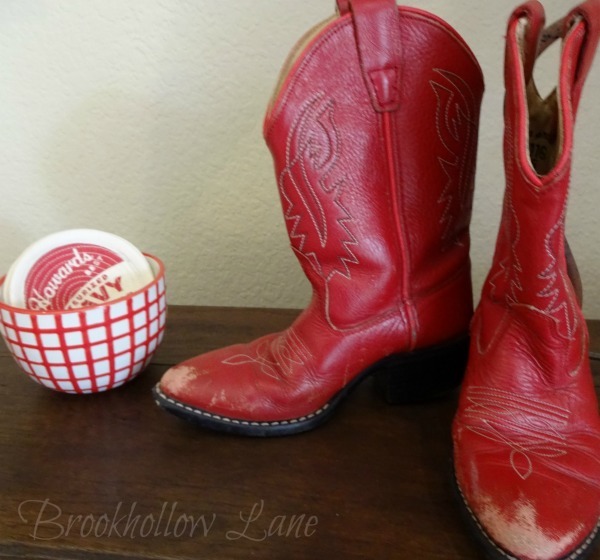 Those mini red cowboy boots are so darn cute!! 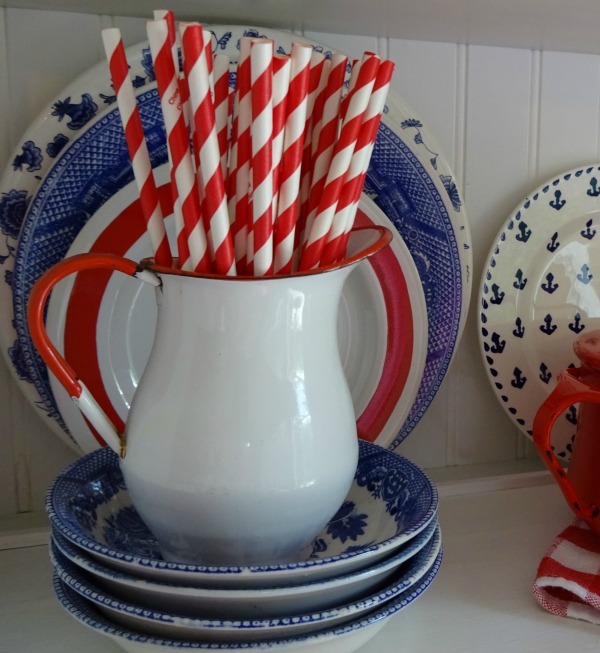 Once I get off the graduation and bday train, I'm pulling out the patriotic and summer decor! Can't wait!